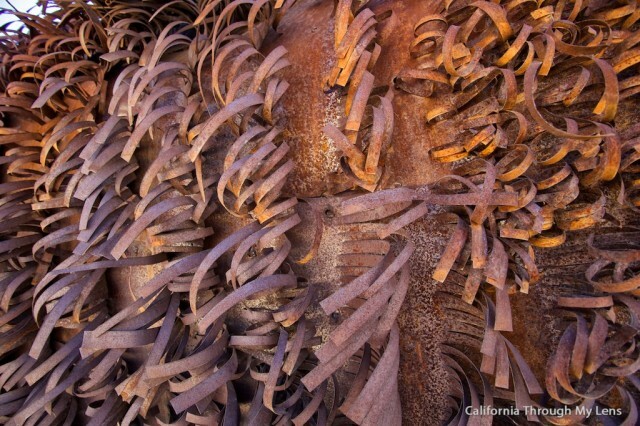 Only in California can a State Park be overrun with massive metal sculptures in the name of art. 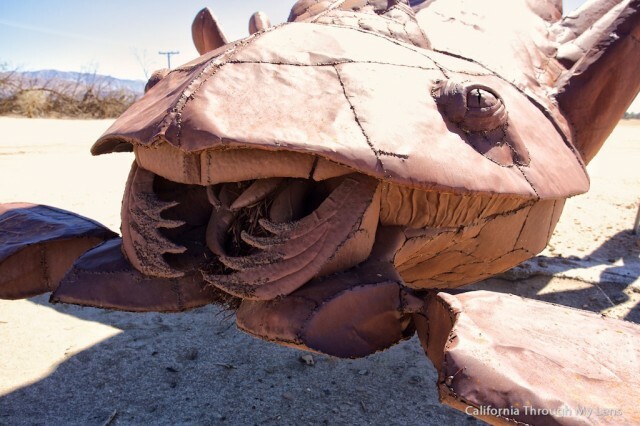 I am not even beginning to complain though as the Galleta Meadows Sculptures in Anza-Borrego are some of my favorite things to take new adventurers to. There are over 130 and as you are driving around they just seem to pop up out of nowhere, it is so awesome. 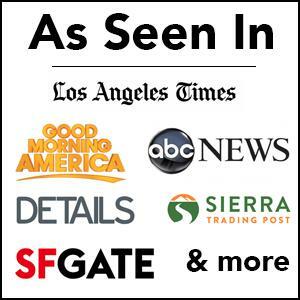 So read on for how to find them and which are my favorites. 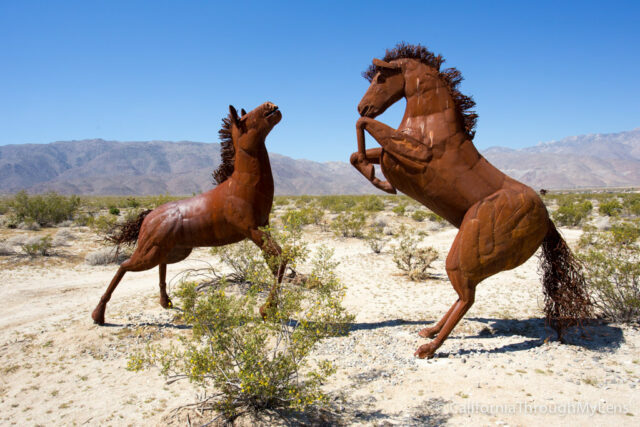 This all began which the owner of the Galleta Meadows Estate, Dennis Avery, decided he really wanted to add a bunch of free standing art to his massive property. 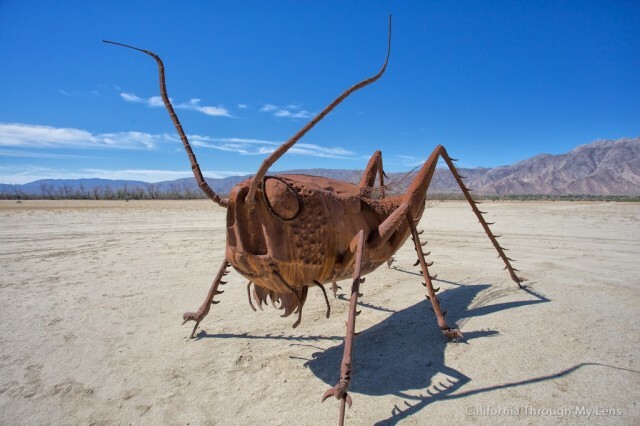 He enlisted the help of Ricardo Breceda who began crafting these amazing sculptures and they started to pop up around the desert. 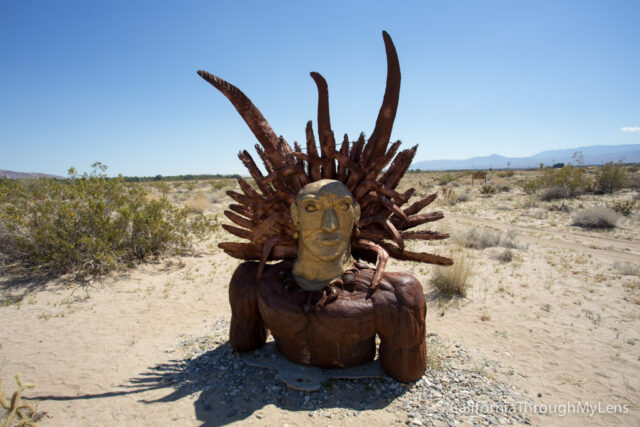 Mr. Breceda often claims that he is done creating the sculptures but then another one pops up in the barren landscape and the speculation continues. 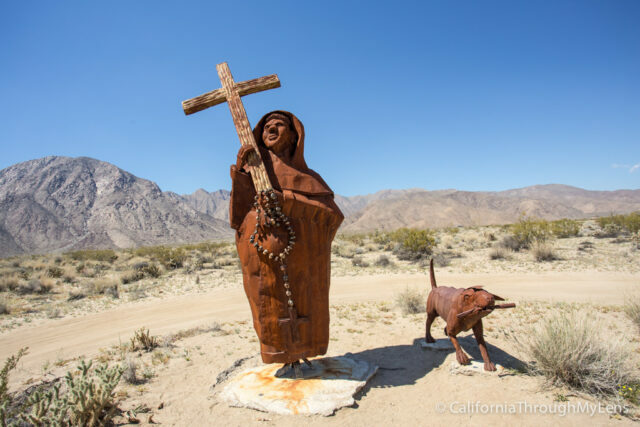 If you are driving from LA or San Diego you will want to proceed down S22 into the valley that houses Anza Borrego. From here the sculptures are literally all over the next 10 square miles. 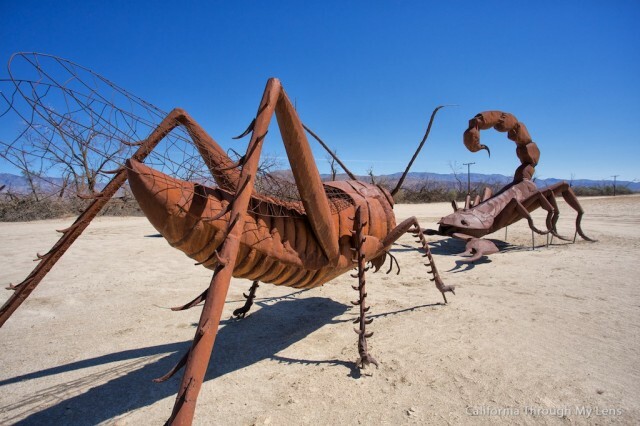 Since the surrounding landscape is so barren it is easy to see them while you are driving. Some are right off the road while others are off in the distance, but most have at least some sort of dirt road to get to them (be careful driving these as they can have some sandy parts). You will want to pick up a map in the city center if you are wanting to see them all as the map will direct you to them. 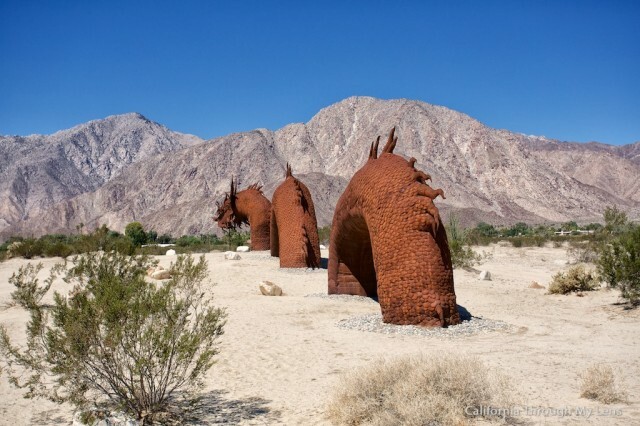 No list would be complete without mentioning the sea dragon as it is the biggest in shear size of all the sculptures and it actually crosses the road so it is impossible to miss. The dragon must be seen to be believed. When I saw it for the first time I just wandered down the entire body to see all of the intricacies in its build. It rises about 15 feet out of the ground and is 350 feet long. The scorpion is my second favorite, behind the dragon as it is so detailed and massive. 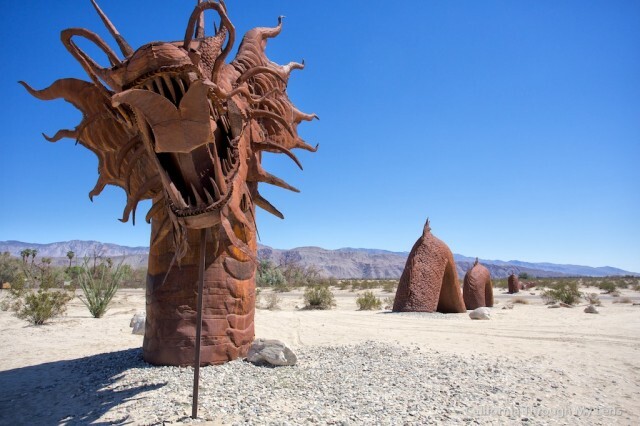 I would say this sculpture is probably about 15 feet tall and 10 feet long. It seems to be in a fight with a grasshopper across from it. The grasshopper is amazing as well and you should really look at its wings as they are so intricate in the way they were made. 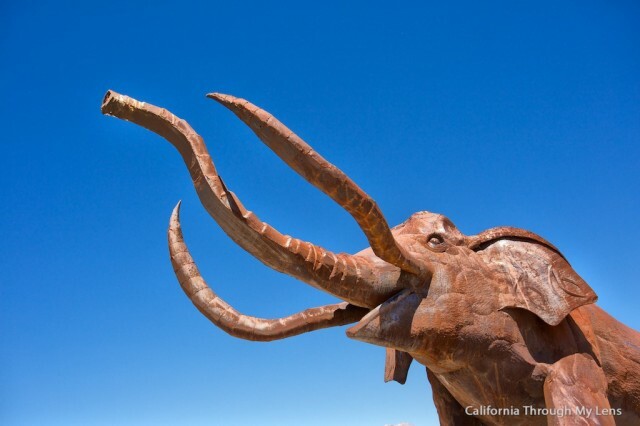 There are a few mammoths as well which are probably 20 feet tall and 15 feet long. They are massive and have awesome tusks. 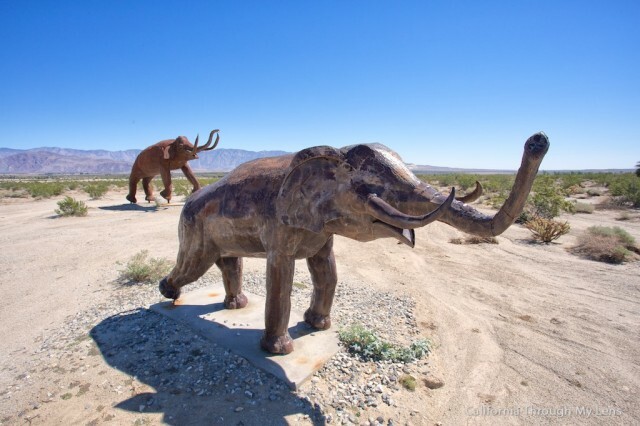 There have been a few skeletal remains found of mammoths in this area which would have no doubt been crazy to see. 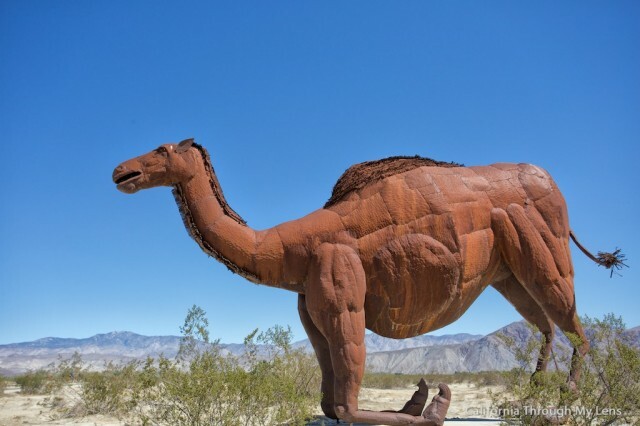 The camels are majestic sculptures with unique fur and postures. I always find it so crazy the way these characters are in positions such as the camel kneeling, it seems like that would be a lot more work but makes for a amazing sculpture. You can see in the above photo how much attention is paid to even getting the muscle definition on the camel. I admit I didn’t know what these were until I looked at the map, but the way he made them laying over instead of standing up is an amazing feat. 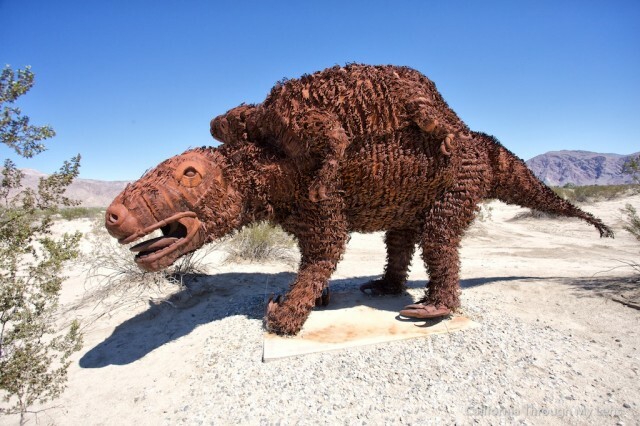 They are designed to look like the Harlan Ground Sloth from the fossil remains that have been found in the area. The sloths also have the most unique fur of all the animals here as well, I cannot even imagine how long it takes to make this “fur” from the metal. It adds another dimension to the artwork. 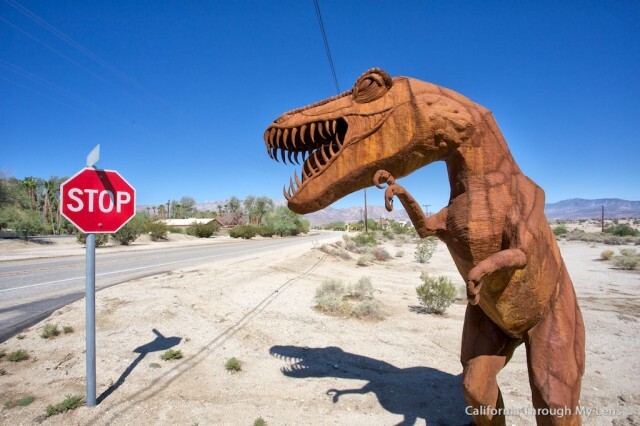 I like to think this dinosaur was guarding the stop sign, but either way it was pretty awesome. This is one of the smaller statues but it is still fun to see. 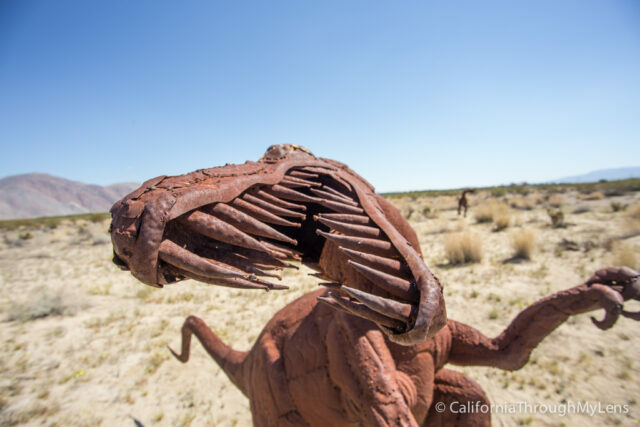 There are a good amount of dinosaurs around the park, at least three separate installations. I especially like the teeth that he uses on the dinosaurs as it gives them a strong look. Most of the horses are not directly off the road but more in the distance, this adds a lot to them as they appear more like actual animals and less like sculptures. There are a lot of horses and I am sure I haven’t even seen them all, but you can see them fighting, galloping, etc. The Indian head represents the Indians that helped play a major role in expeditions to California in the 1770s. It is one of the more different sculptures in the park as the Indian actually has a different color metal for his head. 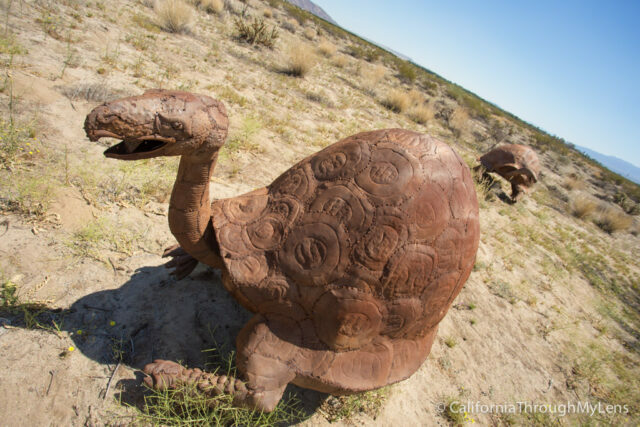 One of the many fossils said to have been found in this valley, the turtles are pretty mean looking but are cool to see. 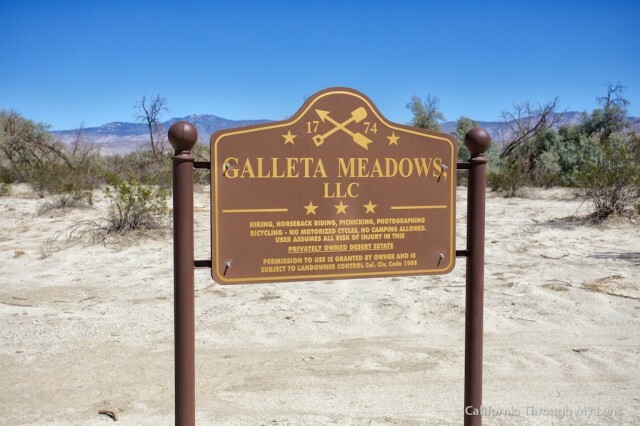 This area was one of the first that gold miners moved to when the rush started. 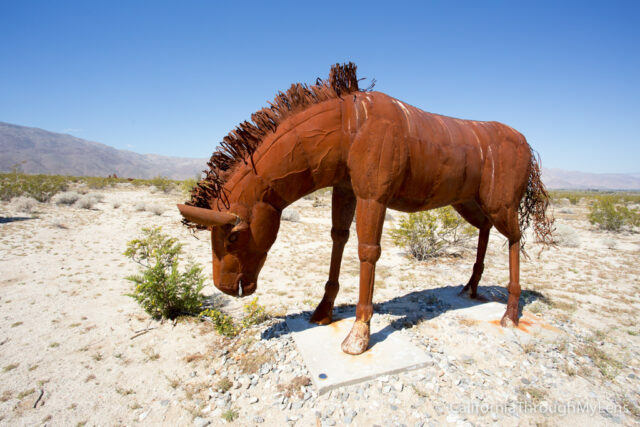 This sculpture is very intricate and the horse itself has a ton of detail on his pack. It is one of my favorites. Another really unique sculpture, this Spanish Padre Pedro Font who was also on the expeditions into the area. 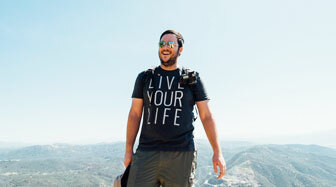 He has a string of prayer beads that are made of rocks and a wooden cross that he is carrying. 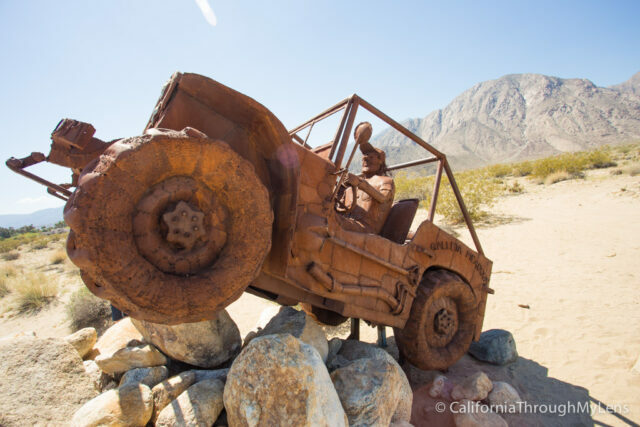 The jeep is made to represent the offroad presence that helped to define both the state park and the area surrounding it. It is modeled after a 1946 Willy’s Cj-3A, which was one of the first Jeep models. 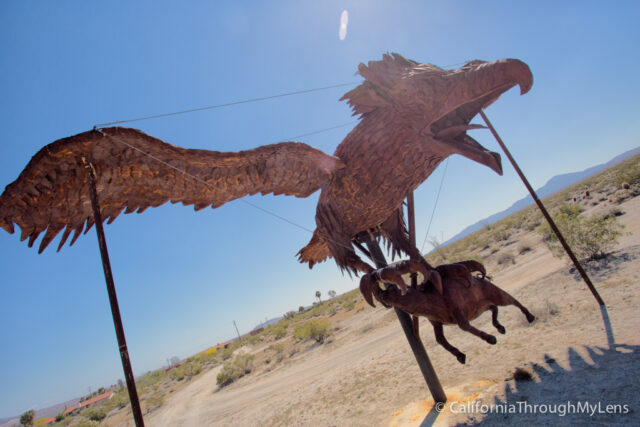 This bird is based on fossil findings in the area which show a bird with a 17 foot wingspan. 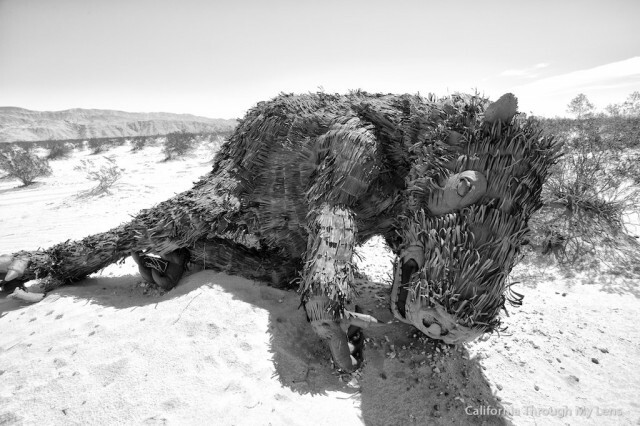 It is shown with an example of what its prey could have been. 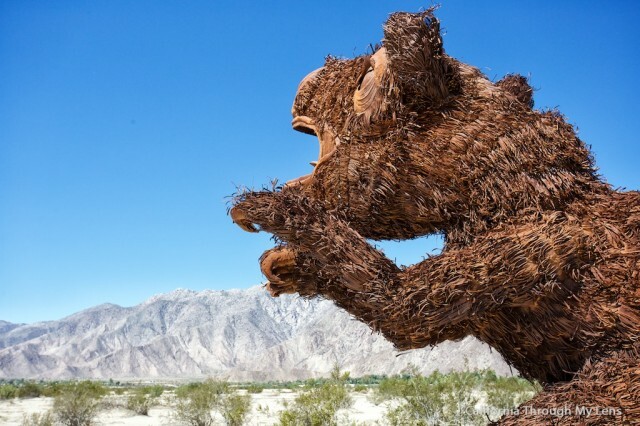 It is a pretty crazy sculpture, especially with the way the feathers look. 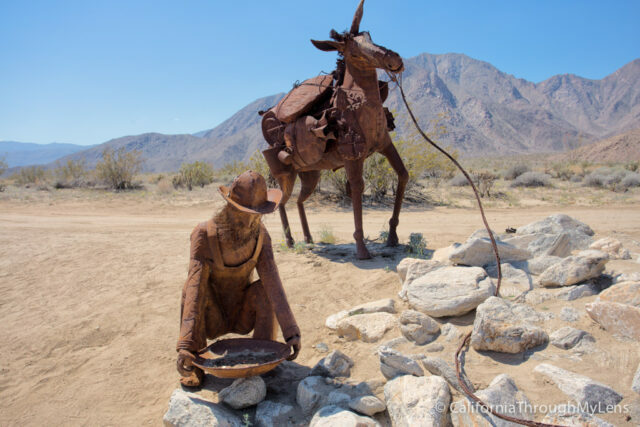 I have seen as many of the sculptures I could find in this area but I am sure there are more I missed. Let me know in the comments and be sure to pick up a map if you make your way down there so you can see them all for yourself.